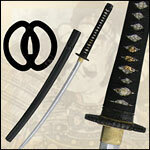 Our Selection of Replica Japanese Katana and Eastern Swords! Katanas - Tai Chi - Chinese - Filipino - Asian - Decorative to Functional! Japanese Samurai Katana and Chinese Swords produced by various sword makers. Battle Ready Japanese Samurai Swords, Ninja Swords, Chinese Broadswords and other quality functional Asian swords for the martial artist, collector or sword connoisseur. Cold Steel Asian Swords are real battle worthy swords that meet our standards and expectations for strength, cutting power, and most importantly, workmanship. High quality Japanese Swords made from Damascus steel for collecting and cutting practice.